Plus, we tease the upcoming series that will kick off The Digital Entrepreneur, which you won’t want to miss. 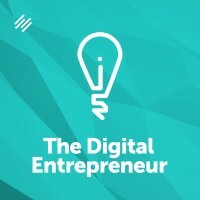 Voiceover: You are listening to The Digital Entrepreneur, the show for folks who want to discover smarter ways to create and sell profitable digital goods and services. This podcast is a production of Digital Commerce Institute, the place to be for digital entrepreneurs. Brian Clark: Oh yeah, I’m loving it. What we need now is another podcast for sure. Jerod Morris: Yeah, it’s new show art, new music. You even got a new co-host here. Brian Clark: New year, although it’s already February. How did that happen? Brian Clark: Yeah, I did notice that. Now, did Mr. Bruce pick out this music like he usually does? Jerod Morris: He didn’t, actually. Jessica was the one who came with the ideas. She had a whole list. I made the final choice, and I think she did a good job. Jerod Morris: Yes, yes. Let’s transition into our topic today. This is the first episode of The Digital Entrepreneur. In our last episode of New Rainmaker, we talked about what digital commerce is. I thought it would be appropriate to begin this episode by basically just talking about who is a digital entrepreneur. One of the statements in this article was, “Every entrepreneur is now a digital entrepreneur”–which I found interesting and I wanted to get your thoughts on to see if you agree with that or if you think that’s too broad of a statement. Brian Clark: Both. I think there’s a lot of truth to that. As we move forward, that statement will become more and more literally true. Now, I don’t know any entrepreneur these days who isn’t using digital technology in some form–so in that sense, sure. Brian Clark: Then, if you really think about the outer reaches in the other direction, we like to talk about online courses, plug-ins, themes, software as a service, but if you look at Airbnb and Uber, these are not software as a service. They are software that facilitate services in the real world, but that is digital commerce. For example, Uber made this point before. If you extrapolated Uber and replaced the entire taxi industry, that software app kills about 300,000 jobs. So it’s basically software platforms that are doing things in very disruptive ways through the ability to connect people. That is an outlier type of situation. I think we all get our feet wet, but the platforms and the technology that’s available to any entrepreneur, you’d have to be crazy not to take advantage of every digital technology that you can in order to be more efficient, to lower costs, to reach a larger market share, reach the right market share– whatever the case might be. Jerod Morris: But our goal on The Digital Entrepreneur and, for example, our goal inside of Digital Commerce Academy isn’t necessarily to teach someone how to launch the next Airbnb or how to launch the next Uber, right? Jerod Morris: Okay. We’re going to spend some time on this show, obviously, diving in to the details and really giving people some tips that they can use to go out and execute effective digital commerce, but let’s think big here for a little bit. Where’s this going? You and I talked the other day about virtual reality. We talked about how it’s the future of viewing sports, but you even mentioned something to me that that’s going to change how we interact online, different environments that are going to be created. Where is that going to potentially take us in the future? Brian Clark: Yeah, it’s very interesting because you really can’t escape the buzz about virtual reality this year. 2016 will be the year that it kicks off. Now, what does that mean for how fast it matures, how fast it’s adopted, how well it takes over our lives? Right now, this podcast is very nuts and bolts. If you haven’t created your first digital product yet, we want to get you there. If you’ve already got products but you’re just trying to grow and then maybe take it to the next level–product category, service category–we want to help you get there. At the same time, we’re going to keep our eye on the cutting edge, and that’s why, of course, you’ve been putting on those Cutting Edge webinars inside Digital Commerce Academy. Those are going to be a lot of fun because that’s where we get to explore the edges. Jerod Morris: So I can buy some virtual-reality goggles? That’s not even the right word. What would be the right term for virtual reality? Brian Clark: It’s a headset. Jerod Morris: A headset. Okay. So I can buy a virtual-reality headset and demo it? Brian Clark: Someday it will be goggles, and hopefully it’ll be like contact lenses. It’s going to be interesting to see how it evolves, but for right now, it’s a big, clunky helmet. Jerod Morris: Yeah, so we will all look really cool while we do it. Brian Clark: Yeah, you don’t want to have guests over when you are in the metaverse or whatever. Jerod Morris: No–unless everybody’s in there. Jerod Morris: Yeah. So that’s who a digital entrepreneur is. Jerod Morris: We’re going to move forward now in future episodes talking about what you need to succeed in digital commerce. Obviously, it’s going to start with creating a great product–whether that be a course, a SaaS product, an ebook, a theme, anything like that–which is what we’re working with folks inside of Digital Commerce Academy to do. Do you want to tease that a little bit? This is an idea that you’ve been talking about that you and I worked on a little bit recently, and I’m excited to start exploring these ideas further. Brian Clark: Yeah, I want to save the meat of this for upcoming episodes. In addition to creating the digital website experience, we’re obviously going to have people on–real-life practitioners, case studies–giving you ideas about how they developed their first products. It really comes down to two things, Jerod. It’s create and sell. If you haven’t created yet, that doesn’t mean you can’t start the process that’s going to lead to sales, which we call ‘audience building.’ This is a big overlap with what we talk about on Copyblogger and content marketing in general, but there is even a more specific argument to be made. Jerod Morris: Yeah. Someone was telling me that. At CES, I think, they were doing a demonstration, and people were wearing the headset. It was a big nature scene that they were in, and it was so real that, when they told them to jump–they had reached a cliff–they couldn’t do it. Something had just happened in their brain that made it feel so real. That’s the way I want to frame these upcoming episodes when we’re talking about the elements. I’ve said this a couple times now, but the switch going on now in what constitutes a minimum viable digital website is shifting–just like it did from brochure sites to content-rich sites. We’re not in the post-content era–content is more important than ever. But the actual way the site is constructed has to be thought out in a way that provides an overarching experience, not just a blog or whatever the case may be. Jerod Morris: Yeah. We’ll spend some time on future episodes talking about that–what that means, what the elements are. Brian Clark: I think we could kick off the very next episode with that topic. Jerod Morris: I think we could. Brian Clark: Why don’t we plan on that? Jerod Morris: Lets do it. Brian Clark: Also, see what else we can get lined up for people to get going. That’s the key here–again, whether it’s creating your first thing or accelerating the thing you’ve got. Brian Clark: The interesting thing about it is that a lot of the fundamentals from Teaching Sells … that was our first product back in the day when people didn’t believe that people would pay for online education. Now it’s what, 15 billion a year? Brian Clark: I have no choice. It’s daily. Jerod Morris: All right. We will talk to you next week, everybody.